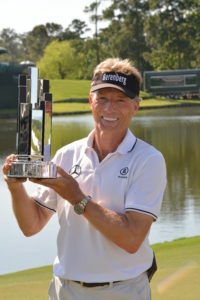 Bernhard Langer saved par on the 54th hole to secure a wire-to-wire victory by one shot over Paul Goydos, Jeff Maggert and Bart Bryant and earn his fourth win at the Insperity Invitational. With his 37th PGA TOUR Champions career victory, Langer became just the third player to win the same tournament four times or more in the history of the age 50-and-over Tour, joining Hale Irwin and Jack Nicklaus. Langer held a one-stroke lead through 36 holes, but slipped to 2-over par through his first eight holes on Sunday and fell three shots off the lead. However, he played the last ten holes bogey-free and added birdies on Holes 9, 10, 13 and 15 for his 11-under total. He started the week with a 63 and followed with a 72-70. Taking a one-stroke lead into the final round on Sunday, John Daly was able to separate himself even more with a front-nine 33 and a birdie on the 13th hole to extend his lead to three strokes. Despite a bumpy ride over the final three holes that included three bogeys, the two-time major championship winner was able to hold on for a one-stroke victory over Tommy Armour III and Kenny Perry, who both hit a few bumps of their own down the stretch. 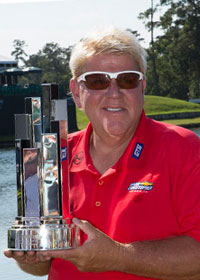 Daly became the third consecutive first-time Champions Tour winner at the Insperity Invitational, joining Ian Woosnam and Jesper Parnevik. 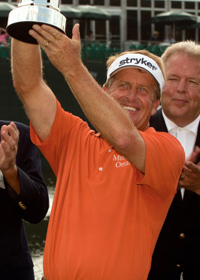 He finished at 14-under-par, the lowest winning score since Fred Funk in 2012 with rounds of 68-65-69. 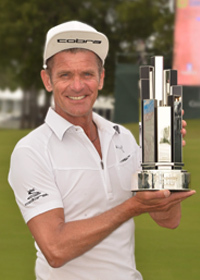 THE WOODLANDS, Texas — Jesper Parnevik won the Insperity Invitational for his first PGA TOUR Champions victory, shooting a 5-under 67 for a four-stroke victory Sunday. The 51-year-old Swede won in his 23rd career start on the PGA TOUR Champions. 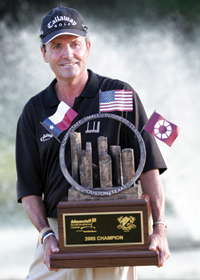 The five-time PGA TOUR winner finished at 12-under 204 at The Woodlands Country Club. Despite an aching back, former European Ryder Cup Captain Ian Woosnam survived 54 holes plus an extra to win his first Champions Tour title at the 2015 Insperity Invitational, defeating Tom Lehman and Kenny Perry on the first hole of a playoff. Woosnam’s 30-foot birdie putt on the first extra hole did the trick and marked the third time in Insperity Invitational history a playoff was needed to decide a champion. 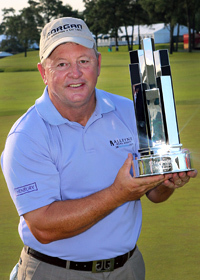 Woosnam also became the fourth player to make the Insperity Invitational his first Champions Tour victory, joining Bernhard Langer (2007), Brad Faxon (2011) and Esteban Toledo (2013). Woosnam’s closing 68 was one of only three bogey-free rounds on Sunday and his 11-under-par 205 total marked the second consecutive year that 11-under-par proved to be the winning score. 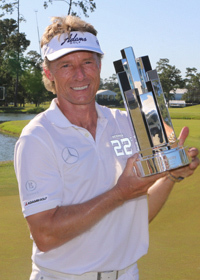 Bernhard Langer’s 2014 victory was with a 205 score as well. Despite a lack of birdies and a hard-charging Fred Couples, Bernhard Langer won the 2014 Insperity Invitational by one stroke on a beautiful Sunday Afternoon. 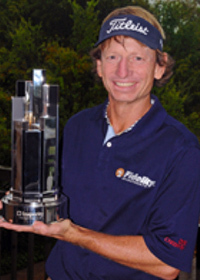 Langer became the first three-time winner of the Insperity Invitational and, for the first time in his Champion Tour career, he won the same tournament three times. 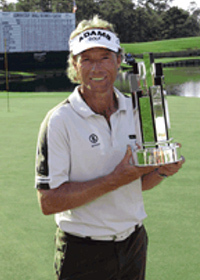 His victory in the spring also helped Langer become the 10th player in Champions Tour history to accumulate 20 wins or more in his career and moved him into the top-10 on the all-time Champions Tour victory list. 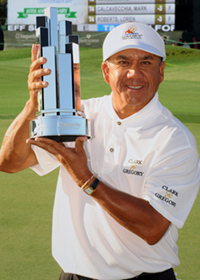 Esteban Toledo celebrated Cinco de Mayo by becoming the first Mexican winner in Champions Tour history, beating Mike Goodes with a par on the third hole of a playoff Sunday in the Insperity Championship. The 50-year-old Toledo, making his ninth start on the 50-and-over tour, eagled the opening hole and finished with a 5-under 67 to match Goodes and Gene Sauers at 6-under 210 at The Woodlands Country Club. Toledo gave a lot of credit to caddie Larry Dittman. Goodes shot a 72, and Sauers — eliminated on the second playoff hole with a double bogey — had a 74. Funk birdied four of the final five holes, including a 2-foot birdie putt on the 54th hole to finish 14-under-par 202. Funk secured what turned out to be the winning moment when he hit a 5-iron on the 18th hole for the 2-foot birdie opportunity. Faxon, an eight-time winner on the PGA TOUR who turned 50 on Aug. 1, shot a 7-under 65 in windy conditions Saturday to take a one-stroke lead at 10-under at The Woodlands Country Club. Tommy Armour III was second, and Eduardo Romero finished two strokes back. Jay Haas, Olin Browne and Schwab Cup points leader Tom Lehman (70) followed at 7 under, and winner in 2010 Fred Couples was 4 under. Faxon won his first title on the 50-and-over circuit in his sixth start. 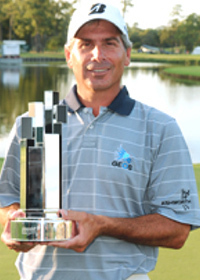 Fred Couples shook off a double bogey on the front nine (No. 8) by playing the back nine 7-under-par 29 to steamroll past a faltering Corey Pavin for the Administaff Small Business Classic title. Couples’ final-round 9-under 63 was the lowest round since the event moved to the Tournament Course at The Woodlands Country Club in 2008. Took the lead for the first time on the par-3 14th hole. Was neck in neck down the stretch with Jay Haas who was bidding for his third win in a row. Cook seized the lead for good with a 12-foot birdie putt at the 17th and was able to hang on and claim victory by 2 strokes over Jay Haas and Bob Tway. Successfully defended his title when he prevailed by two strokes over Lonnie Nielsen. Made birdies in Nos. 11, 13 and 14 to take the lead, and the former Masters champions never looked back. 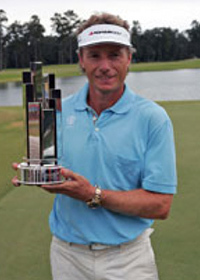 In route to winning his first Champions Tour event, Bernhard Langer set a new Augusta Pines course record of 10-under 62. 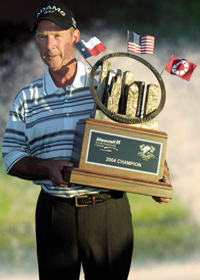 Winning wire to wire, Langer’s 54-hole total of 25–under par 191 matched the Champions Tour all-time scoring record. 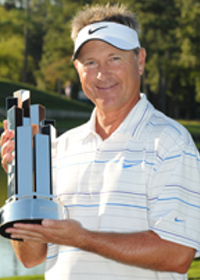 Jay Haas broke the Augusta Pines course record in route to winning the rain soaked event. He took a five-stroke lead into the final round after shooting a 9-under 63 in Saturday’s record-setting second round. Haas was 17-under par after five holes when officials stopped play. He won with a 36-hole score total of 128. Mark McNulty birdied two of the last three holes and also had two eagles in the final round for a one-stroke victory over Gil Morgan in the Administaff Small Business Classic. McNulty took the lead with a birdie on No. 1 and two-putted from 43 feet for another birdie not he final hole to finish 16-under 200 total for the win. Larry Nelson rallied form far off the lead and made a 5-foot birdie putt on the first playoff hole to beat Hale Irwin and win the Administaff Small Business Classic on Sunday. Nelson, who started the final round seven shots back, closed with an 8-under 64 and tied Irwin (67) at 14-under 202, winning his second Champions Tour event of the year and 19th overall. © 2018. Insperity Invitational. All Rights Reserved. Insperity is the sponsor for this event and does not endorse the products or services mentioned within this event or on this site. 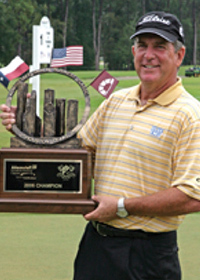 This web site is managed by Pro Tours, Inc. and will act as the administrator for the Insperity Invitational tournament.